All transactions are safe and secure with a reliable history in online purchasing behind each of our associates. Buy the Edward vs Jacob t-shirt to own Twilight clothing and merchandise. 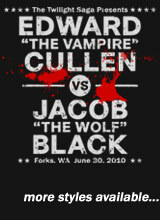 Wear this Edward vs Jacob tee and tell everyone that you saw the two rivals fight at Forks High School. The design displays a fight card style image that pits Edward (Robert Pattinson) vs Jacob (Taylor Lautner). They fight for the love of Bella (Kristen Stewart), who pleads in the movie, "Please don't make me choose." Fortunately, your choice is easy with this great showdown tee. The Twilight movie, based on Stephenie Meyer's book, was filmed primarily in Portland, Oregon, contrary to the book's setting of Forks, Washington. Kalama High School served as the school over Forks High School itself. In addition to the Edward vs Jacob tee above, browse the Twilight Clothing Gallery for more apparel like men's and women's clothes, kids shirts or hoodies.